We have reached the big 100 !!! 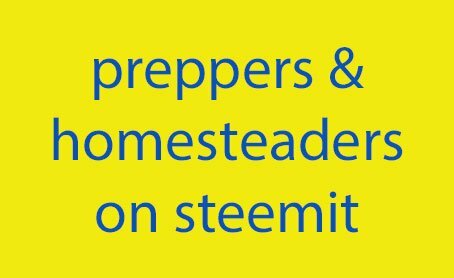 I have now found 100 homesteaders and preppers on steemit. Quite a growing community. And I'm sure there are more to come. I hope fellow homesteaders and preppers find this list useful for networking, making connections, sharing ideas and learning from each other. 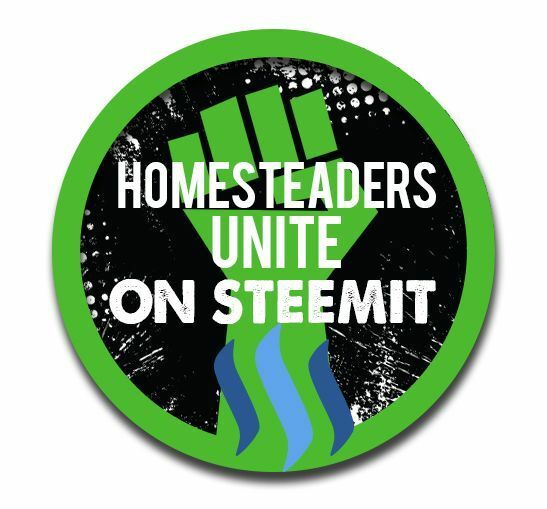 Hopefully we can also support each and help the homesteading and prepping community prosper here on steemit. If we can keep an eye out for each others posts, and resteem, upvote and comment as the mood takes you then we can all gain. So here is the latest list of homesteaders and preppers. My apologies if I have missed anyone from the list that has already contacted me - just post in the comments again. Or if you know anyone else who should be on the list let me know. Come on Canada, there is only 4 of us. I know we have a short summer for growing stuff, but we do grow stuff, there has got to be more of us. Happy Canada Day 150 to my 3 other Canadian Friends, on this list. Thank you. Are you a fellow, Prepper and dare I say Canadian....LOL I believe as of this mornings list there were just 4 out of 100. I am a fellow prepper, however I am not Canadian. If I had to leave the United States, I would prefer to go north instead of south. I have much love and respect for our neighbors. I'm almost Canadian...south side of Lake Superior, eh. SAVED! This is great! Thanks for putting it together. UP- voted my friend. This is as good as gold for me! Much appreciated. Thank you @stillwater - glad it is useful. Hi @vegansilverstack, you are on the list - new version coming out imminently. Wow thanks! This is so helpful! Love not having to look all over.. Going to resteem. Thank you for the resteem - most appreciated. This is fantastic. resteeming it. Hi @ecoinstant, you are now on the list - new version coming out imminently. I am now working on version 6. If you know any homesteaders or preppers that aren't on the list do let me know. Thank you. This is a great list! Thank you for compiling it! I'm just getting acquainted with steemit and I'm looking forward to being able to support like-minded people here. I like what you said about supporting each other and helping the prepping community prosper here on steemit. I am going to take the time to meticulously follow and upvote each person on your list. It will take work on my part but it's going to be worth it. Upvoted, resteemed and followed. Respectfully request to be added to the list. @prep4shtf and thanks in advance for your time and effort. Thank you for the resteem @prep4shtf . You are now on list. Thanks for putting me on the list. I know from watching some of these people are great homesteaders and preppers keep up the great work. So glad you put this list together! It is so useful! Upvoted and resteemed! Glad to be a part of this community! Thank you. Yes I'm looking forward to developments to improve how steemit works. Thank you for the great article! This post has been featured in this week's issue of the Weekly Homesteading Newsletter! That's great @kiaraantonoviche, thank you. Well, looks like about 99 customers for @daddykirbs badges. Thank you @weetreebonsai for these links. I recognise them from YouTube! More YTers coming over to steemit! YW, and the list is growing every day. @pennsif this is wonderful!! Thank you so very much!! You put a lot of work into this and it is awesome!! You rock!! up-voted and re-steemed!! Thank you @alicemarie for your kind comments. New version of the list coming out imminently. Hi @wavemaster, you are now on the list. New list coming out imminently. HELLO ALL YOU CRAZY PREPPERS AND HOMESTEADERS!! Greetings @mericanhomestead, thanks for dropping by. Kumusta! thanks for sharing this.. I know who to check out for more homestead stuff.. followed u and upvoted.. Thank you for the resteem @christa - much appreciated. New version of the list coming out imminently. Hi @mother2chicks, sorry been busy for the last few days. You are now on the list - new version coming out tonight. Just wanted to stop in and let you know I was thinking of you and hope all is well! Hi @farmstead, thanks for dropping by. All good here - just been busy putting up the new polytunnel (hoophouse). Now catching up and compiling the new version of the list - should be out later this evening. Ooooh nice that you're giving yourself a hoophouse! Can't wait to see a post on that and what you do in there! I've got sweet potatoes, courgettes, sweet corn, tomatoes and a couple of melons in there so far. About half filled now. Still deciding what else to go in there. Gets very hot to work in there during the daytime though! YEAH. Do you got a nice ventilation system going on? You just need to do a post! I would like to think of myself as a semi prepper/homesteader type of person...at least I was before we moved from missouri to colorado...it's hard living in an apartment & trying to grow your own herbs & whatnot. Hi @lone-sliver, you are on the list - new version coming out very shortly. It's a bit of a homesteading challenge living in an apartment, but there is still plenty of prepping you can do. Yes there is, I have a lot of experience & knowledge with gardening, I utilized a couple of hanging vertical planter techniques at the apartment, we made sure our patio faces south to get the best sun, etc. I am also a professional chef so I have done a lot of work with preserves such as salsas & pickles & whatnot. I look forward to seeing/contributing to more of these type of posts. Sounds good what you are doing so far. Maybe you could get some microgreens growing too. I'm too late to upvote or resteem this post, but thank you for the info. Could you also add @Preppers as well as @AmericanPreppers Also, could I use this list in my posts as well? I can credit you as the originator of this list. How exciting to see so many people on so many different adventures. Thanks for including us!